It's Wednesday, and even though I did not "run" the race. I am still catching up on sleep. I ideally would have liked to have posted this report a couple of days ago, as it's all old news now, but lately, I crave sleep like a teenager!! I could not have survived the weekend without help of such awesome friends. I'll toss a thank you out here and there, starting with Susan Westmoreland. 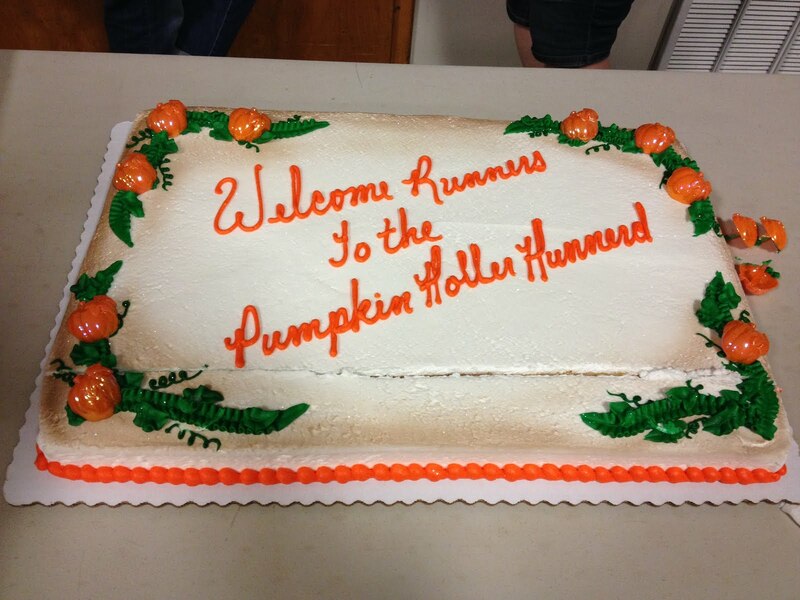 Susan ordered this cake for the pre-race dinner, ordered the pizza from Sam and Ella's (AMAZING PIZZA!! ), made the race signs, worked at the start/finish aid station, crewed a friend, helped pick up aid stations stuff, loaned me her truck during the race, and I could go on and on. The pizza and cake were a hit. Out of 28 large pizzas, there were two pieces left. Stormy, Brian, and I went over race particulars, and all went well. I left confident that at least everyone there knew what to expect as far as where to go and such. 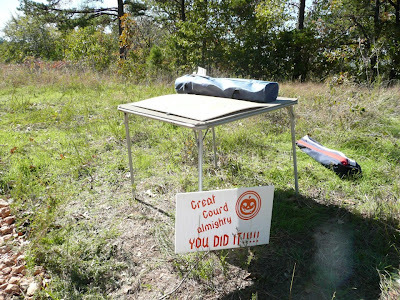 I made it back to camp, and loaded up the food containers and water jugs for 9 aid stations, and retired for some sleep. I got in a solid 4 hours of shut-eye to go with the 4 the night before. At 4:30 am, Stormy, Edward, and I were in the big U-Haul driving the loop, dropping off tubs of supplies and water jugs. We made it in an hour and a half, and were back in plenty of time for the pre-race briefing. Taken from the starting line looking west. How could one ever tire of this view? It seemed fitting that the RD of the Pumpkin Holler Hunnerd should be haulin a pumpkin. The plan was to smash this big boy to start the race. Stormy and I took turns giving out orders. The minutes before the race are nerve-racking. You plan and prep and pray. Every race can have hiccups, and big snafus are a nightmare. Fortunately, the problems were very minor both last year and this year. I wandered around and visited with friends, and took a few compromising pictures. Should I put a name with this hairy bod?? Better yet, can you name the owner of these nips? Five, Four, Three, Two, (pumpkin heaved into the air) One, (gun fires), and they were off. 8:00 am sharp. The 100 mile, 100K, and 50K all were off. The 100 milers had an out-and-back to complete before starting the 50K loops. 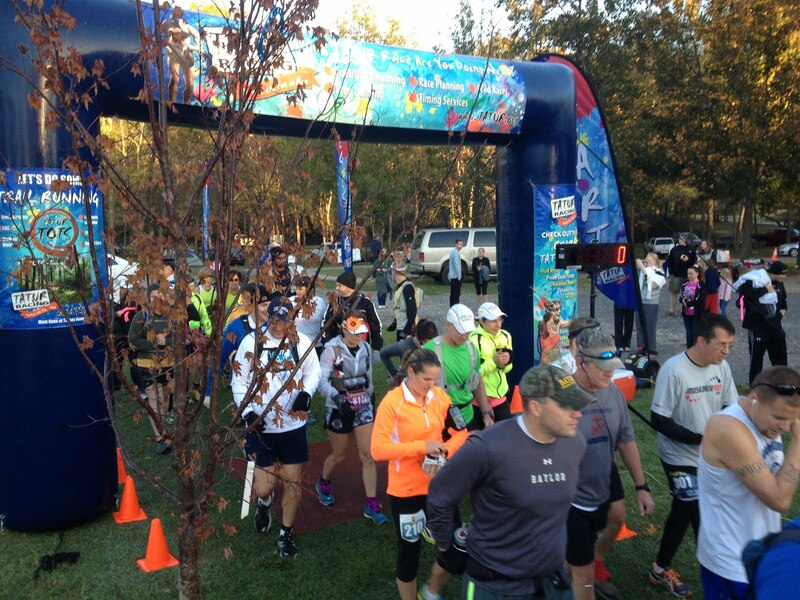 This out and back brought a lot of traffic back to the start/finish aid station, and the 25K then started at 10:00 am. Race Central was a busy place. Here lies the remains of the Pumpkin Holler Hunnerd starting pumpkin. I also smashed one for the start of the 25K. It was a tougher gourd, and did not crack open as well. We had though about shooting it with a shotgun. I'd like to get a big M80 and blow it up next year. The race begins with crossing Comb's Bridge. Each 50K loop ends with crossing it. 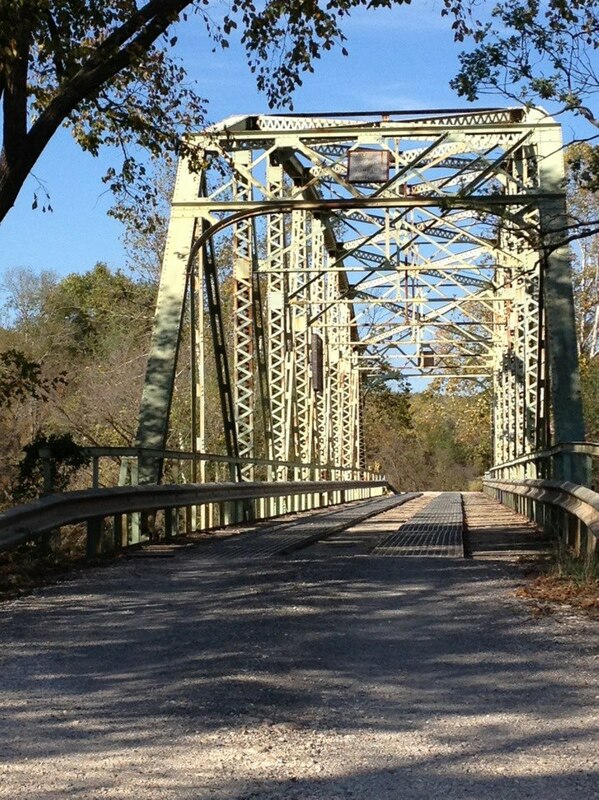 Next year may be the last year for this beautiful bridge, as a new ugly concrete bridge is being built downstream and this one will be dismantled. It's very sad, but the cost of having inspections and maintenance on it is astronomical. 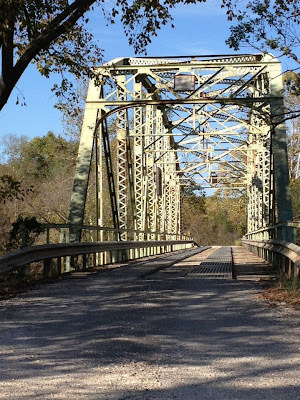 Bridges like this are a dying species. 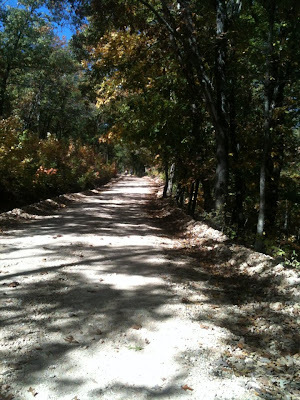 Mile 3 in the loop brings runners to a stretch of gravel road with high bluffs on the right and the river on the left. It's hard to take a bad picture through here. Meanwhile, on another part of the course (the out-and-back portion that the 100 milers have to run) Mitch Drummond mans the Waffle Stop, serving --what else?-- WAFFLES!!! 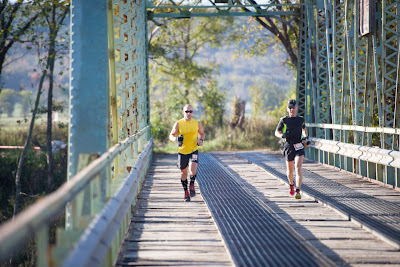 Last year, after the last 100 miler came here and turned around, Mitch was through. 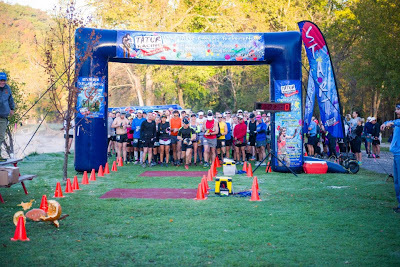 This year, the 25Kers climbed 500 feet to eat, then ran another 3.5 miles, turned around, and came back for more waffles before returning to the finish line. Thank you, Mitch!! Mitch then came back to the start/finish and helped out there for a while, and then paced Bobbie Ruhs from Nebraska on her second lap of her first 100K. WOW! 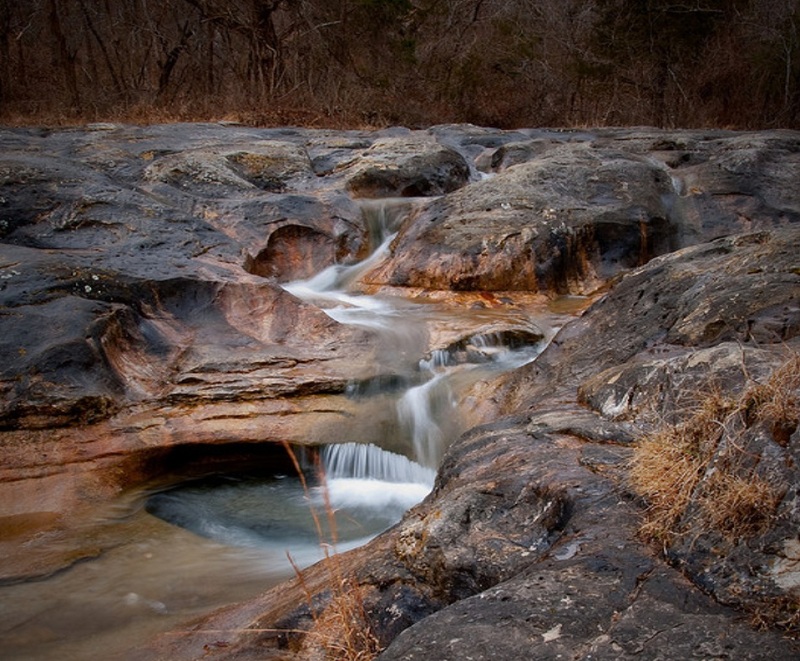 The next several pictures are taken on or around Combs Bridge. Podium Images did a super job, taking over 1,200 great pictures, and they can be viewed and purchased on their website podiumimages.com. Here, Christy and Rachel (both first time 100 milers) chat it up on their way back to the start/finish before heading back out for their first loop. 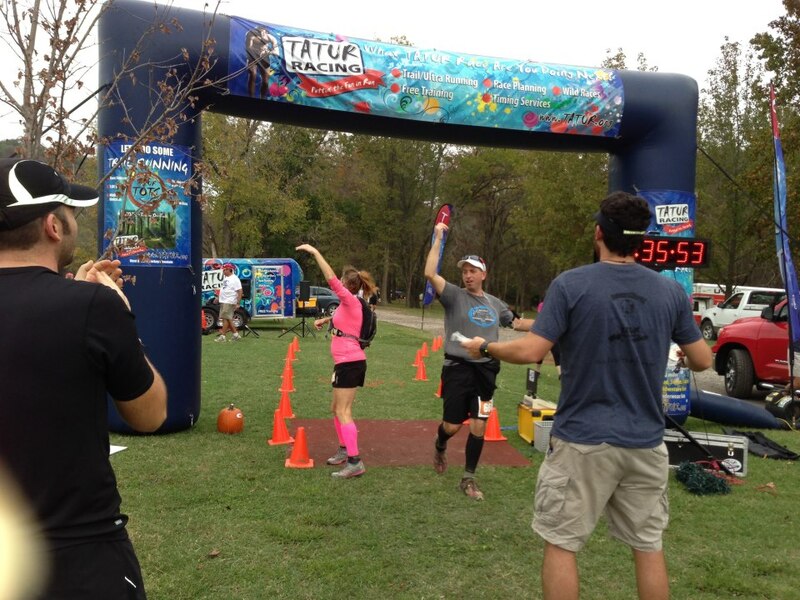 Wes Rupell, also a first time 100 miler, ran the entire race with Christy. It was like they had a pacer for the whole race. They really never looked like they were struggling. I guess no one told them running 100 miles was hard. Back-to-back hundreds is asmazing. Arnold pulled it off last year. This year, he was gunning for three in three weeks!! (Arnold had me pick him up at mile 45. He was in much pain, with every other step, and 55 more miles of that was not in the cards.) He will pull off the trifecta though, I have no doubt. 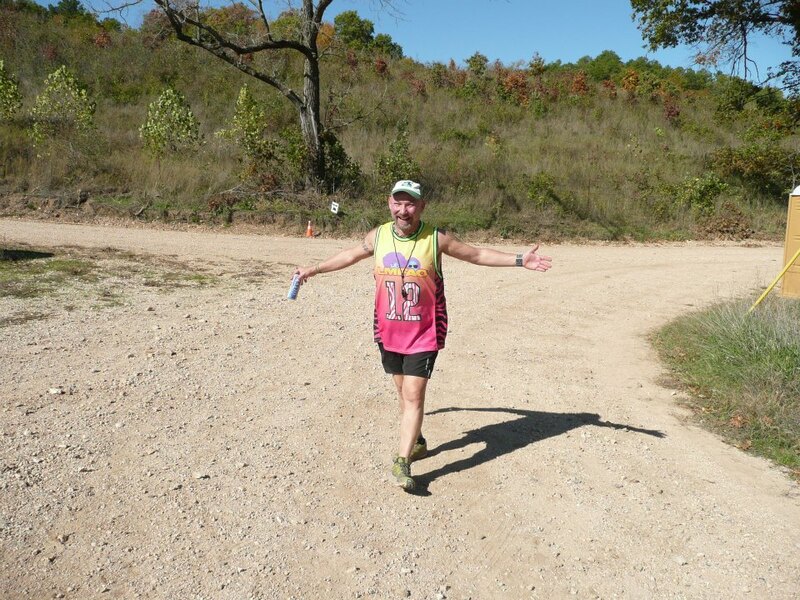 Another friend, Ron Ruhs from Nebraska, did the 100K last year. His wife Bobbie did the 50K last year. 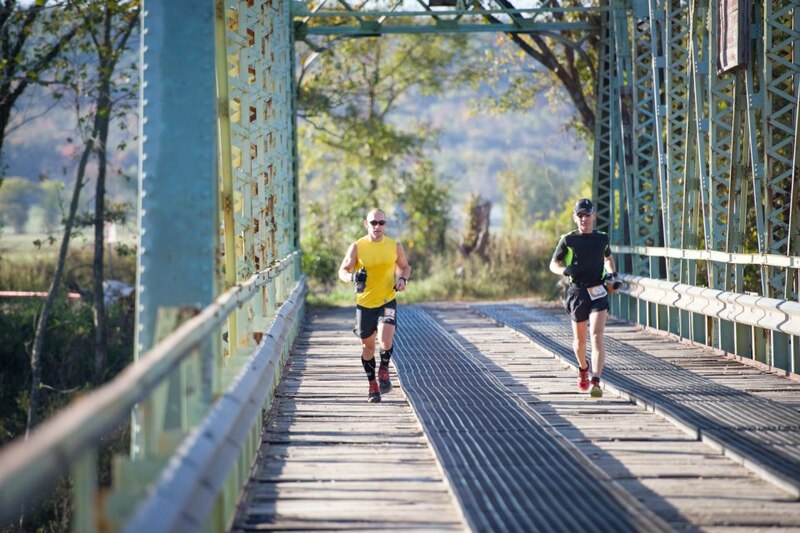 This year, they both stepped it up with Ron taking on the 100 mile and Bobbie the 100K. They do a lot of our races. We need to go up and run with them in huskerland. Ken Saveth of Know No Boundaries tries to tough out another hundred, raising money for his foundation to assist people with handicaps in overcoming their boundaries. Kevin and Ashley Lemaster ran the Mad Dog aid station at mile 5 again this year. This stop featured a giant fire hydrant (a porta-john decorated to look like a dogs pee place), gingerbread dog biscuits, and workers with dog masks. They camped out the night before the race, worked all day, all night, and then took down all the tents and tables, loaded it all up, and brought it back to race central. They are AWESOME volunteers. I love them! There is no end to the beauty of the course. The trees around the Illinois River were a lot greened than they were in Tulsa and other parts of the state. A lot of the leaves were turning. I bet in another week, they will be even better. This is part of the 25K course. This is about a 1/4 mile before Savannah Corner at mile 13 in the loop. Randy and Marcy Ellis along with Lyle Robertson, worked here all day, all night, and until around 8:00 am Sunday morning when the last 100 miler came through. 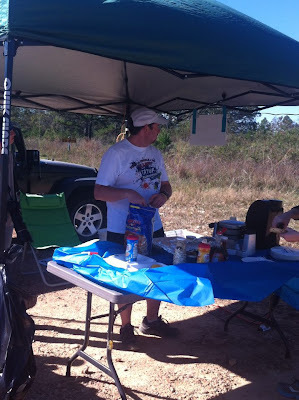 Backing up an aid stop to the Out N Back (mile 7 and 19), Joel Everett, his sister Retta, a guy named Gordon, and there were a few others I am sure manned their double-duty stop like a boss. There is no way to thank people enough, but believe me, I am so lucky to have their help. Amnazing. They're awesome. This is the turnaround for the 25K course. Lyle worked here until the last of the runners came through, then scooted around the corner and down the road to Savannah Corner. Ed Lebowski, along with Derk and Barbara Pinkerton, and Wilma Harris, manned the East of Eden aid stop. This was also the location of the Great Gourd Challenge, an elective mile(ish) that any 100M, 100K, or 50K runner could do on their first loop. This diversion featured the steepest hill in the area, a 350 foot climb crammed into .3 of a mile. Not much at the top of the hill--just this table and a pin to wear on your shirt. 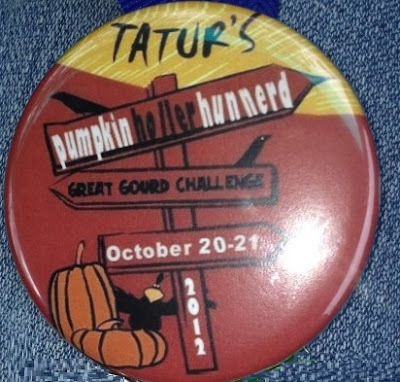 The actual road on the course with the most traffic was Pumpkin Holler Road. 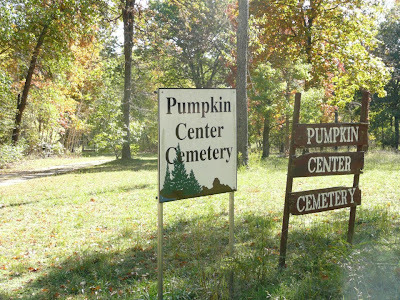 I have heard a little history about Pumpkin Holler, and I will do a lot more research on this before next year--the area is not named Pumpkin Holler because of the orange gourd, but because of one of the original families in the area, whose last name was Pumpkin. More on this in a future post. 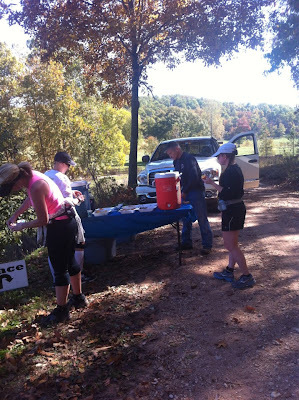 After Hard Up Ahead--aid station at mile 22 on the loop--there is 3 miles of pavement. It's old asphalt, and in places, there are patches where the blacktop has eroded away. 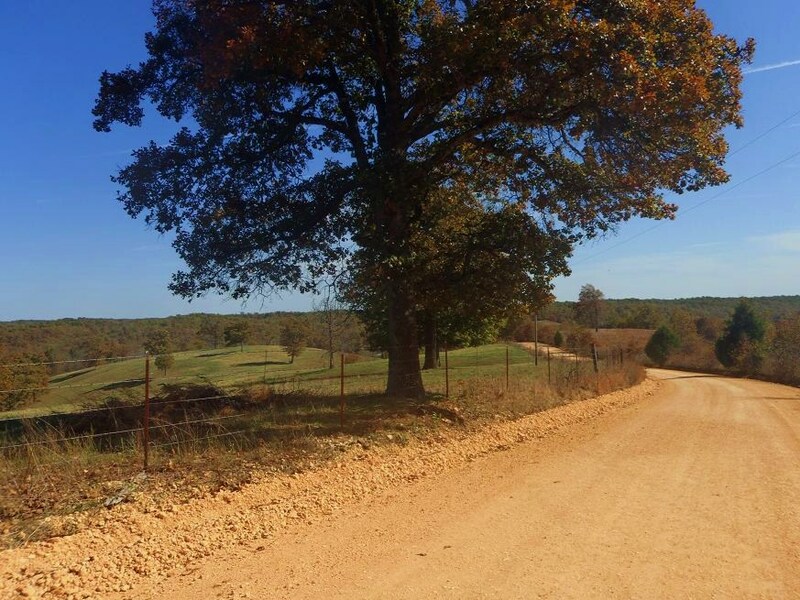 It's about as good as pavement can get, from this trailrunner's perspective. This stretch lends itself to quicker leg turnover, and shaving off a few minutes of a finishing time. 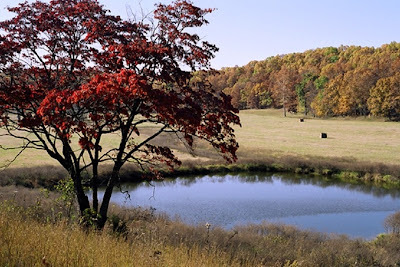 I have taken pics of this red maple for the past 3 years. 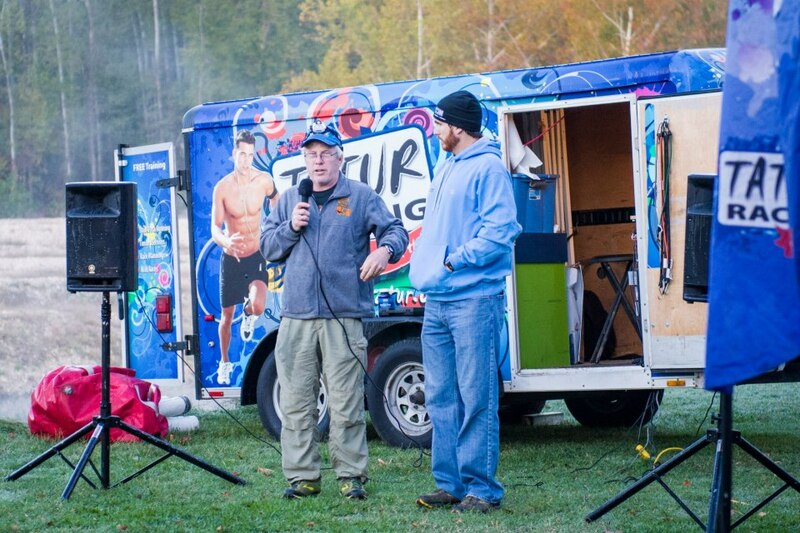 Back at Hard Up Ahead, Earl Blewett and Chuck Streit hung in there all day and night, and well into Sunday helping weary runners. Chuck made a huge vat of jambalaya. It might just be the best ultra food ever. I ate a BUNCH of it. Love it!! This year. we put an aid stop at Bathtub Rocks, and then another three miles down the road. This made the last 3 stops three miles apart, and since most of the runners went through this section in the warmest part of the day, I thought it was a good idea. No one complained about it. :-) Brian Smith, and his wife worked here all day until around 2:00 am. Brian was signed up for the 100K, and messed up a foot. He could have stayed home, but came out to volunteer--from Missouri! Many thanks!!! Brian and I will probably run a few miles together in Kansas next year at Prairie Spirit. Rafael Robles relieved him, and worked until the last runners came through. This dog followed runners all the way around the course. I bet he'she got ultra distance and then some. I know it was sighted in several places around the course. I saw it as I picked up drop bags at 8:00 am, and then again at 3:00 pm Sunday laying in the road at Savannah Corner. He was pooped. I hope he is ok. The magic of the finish line, lit up at night like Las Vegas. Mike Adams and Nick Seymour ran together for a lot of the race. Nick pulled ahead, and then at mile 85, Mike made a move on Nick, passed him, and never slowed down. Mike got the win, the course record, and a PR for his 100 mile distance (the actual distance of PH100 is 102 miles.) Congrats, Mike. And Nick. 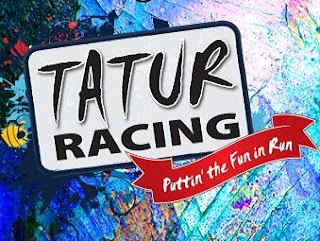 Race results can be found here. Christy and Wes finished in 26:10. They ran the last half mile (and most of the race) at a brisk jog. All grins. They absolutely nailed their first 100. Rachael Regier finished her first hundred, paced by fiance Tim Eraker. I am proud of her for hanging on and getting it done. Russell and Kathy crossed the line and were glad to be through. Kathy got her 12th finish, and second in two weeks. Russell got his first 100 on his first try--on his birthday! Russell ran well, until the gravel beat his feet up. I did not see his feet, but I heard they were mangled pretty bad. Did no one take pics???? Kathy crashes into a chair. Her shirt visible through the mesh of the chair was so appropriate. Christy had just one blister, but it was a doozie. It had personality. A few hours later, all was picked up and loaded, and we headed for home. I love this area. And of course, being around it and not getting to run is gnawing on me. Last year, I came back to run an unofficial 100. I'm not sure if I'll do another 100 mile fun run, but maybe a loop or two. 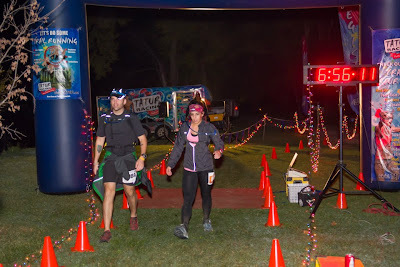 More thank you's: To my lovely wife, who went sleepless for more than a few nights putting aid station kits together, working the finish line, and packing and unpacking. 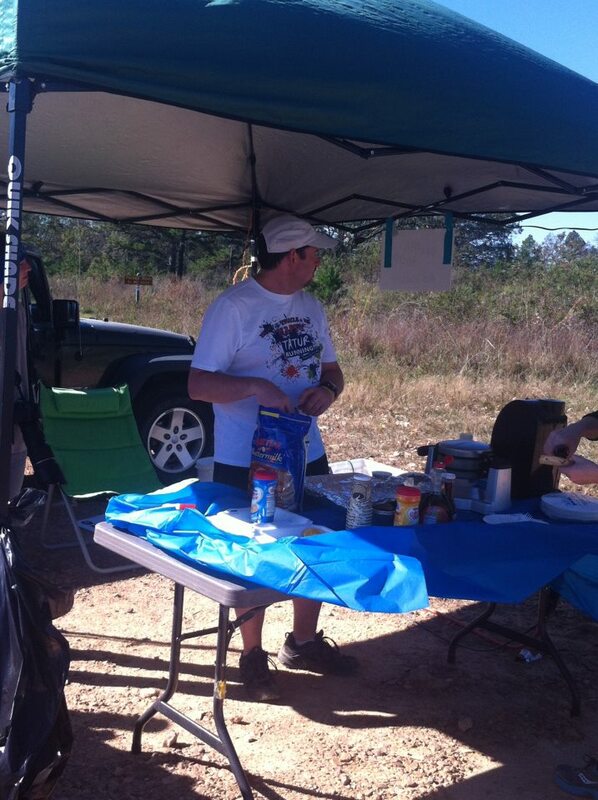 She's the crew babe/aid station extraordinaire. Brian and Stormy for being awesome Co-RDs. We all work well together, and are better together than any three people could ever be. 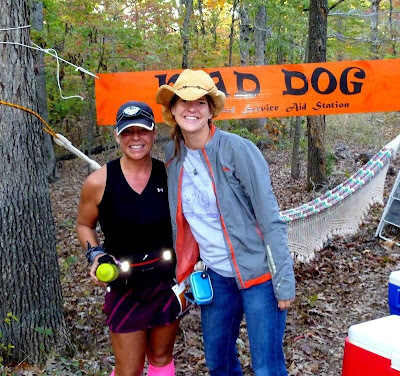 Shannon and Jody McFarland--those Rush Running peeps--the ones who come over from Arkansas and win all the Snake Run trophies, yes the same Shannon who just tore up the Arkansas Traveller a couple weeks ago--came and hung out, and helped in every way around the start/finish. Truly, I don't think we could have had things go anywhere as smooth as they did without their help. Thank you, you two!! Candice Brown came and helped all day, all night, and most of the day Sunday. She took tons of pictures, and I can't wait to see em!! She was all over the course, and I am sure she got some awesome pics. Chip Weber and Scott Smaligo for helping at aid stations here and there, and then hours loading and packing aid station stuff. Simone, Shorty, Mishelle, and Nedra--who all ran the 25K, and then went to Last Gasp to work until way after dark. Cheryl Ford worked at the Out N Back while editing for her friend Tammy Winn. I had told her that she could see her twice per loop there, and she ended up volunteering all day. Brynna who did everything including going for more supplies, working the start/finish, and cooking for hours Sunday morning. 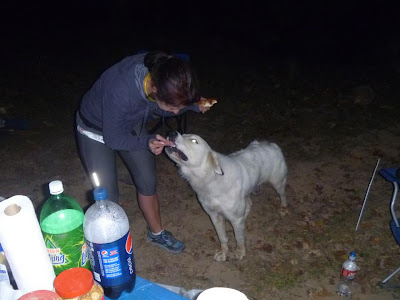 Lynna, who ran 50K, and then helped out at Savannah, and at the start/finish, and also did some gophering. 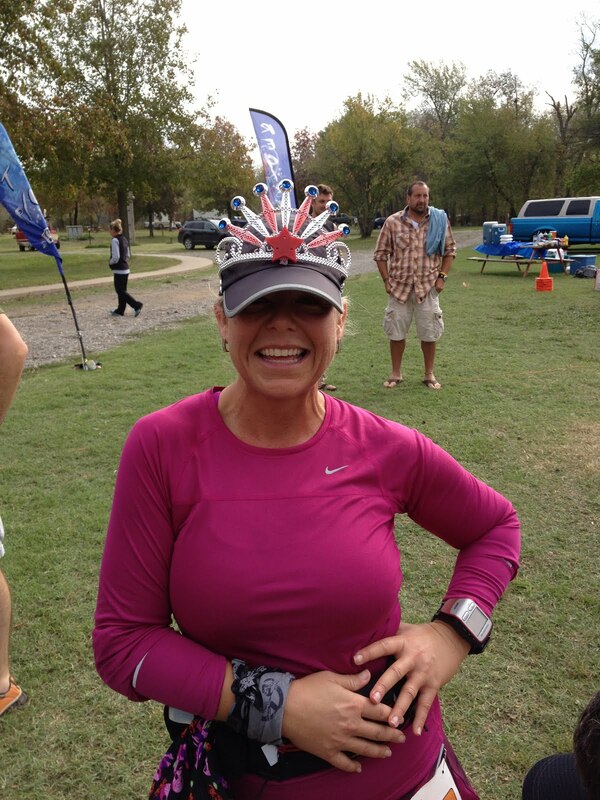 Lori Enlow, who ran 25K this year, and then worked out at Savannah Corner. She was lined up to pace a runner for half a lap, but her runner dropped. 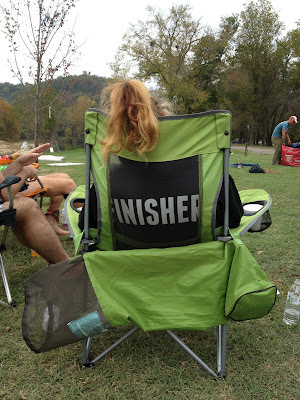 Lori also did a lot of leg work, securing a place for us to have the prerace dinner. Thomas Gilbert, who handed out medals all day. Susan Alexander--she helped out at the start/finish Sunday morning, and best of all, brought me a pot of award-winning chili!! Bill McKee, and Bailey and Kristina Leiber, who made the drive down Sunday morning to work Last gasp aid station. William Wharton, who ran 25K, then spent much of the night working Last Gasp in the dark, while waiting for a friend who was having a tough time with the 100K. A complete stranger to me helped selflessly for hours. Love it!! Thank you--all of you--my wonderful volunteers. I am sure I am overlooking someone, and if I wake up in the middle of the night remembering someone I forgot, I'll add my thanks here. Come run Pumpkin Holler Hunnerd in 2013!! !